And the fact that this Friday marks the end to a really good week. Last time I posted Friday Facts, I definitely wouldn’t have considered that week the most positive one I had ever had. In short, over the course of five days, I got a sinus infection, had two different sick babysitters, and lost my keys on a quick errand to Kroger … all on approximately five hours of sleep TOTAL as my sweet girl decided to stop sleeping unless she was being held. What I didn’t include in that post because it happened later that Friday afternoon? Losing my cell phone and having to retrieve it (cracked) from a homeless man who found it on the side of the road. I won’t even begin to defend myself on that one. So yea, it’s safe to say that this week has been a little bit better. Life is back to normal around here as Waverly Maye is now sleeping again. On a side note, I am extremely superstitious, so fingers crossed I don’t completely mess this up by proclaiming this major milestone. Getting to this point was certainly not fun (a few nights of tears, both from Mommy & Waverly Maye), but now that we are here, everyone is much happier. Even the dog. This week’s crest & crash? Again, they are one in the same. It’s funny how that always seems to happen. I believe that Waverly Maye is about to crawl. That’s right, people. I said it. My entire life, as I know it, is about to change drastically. The days of setting our newborn down on her playmat to grab at the toys above her as we admire her calm, serene self are about to be OVER. It’s time to baby proof the house because something tells me this little lady is going to be a wild one. Momma, this is one big world. You really expect me to stay still? How would I ever see it all? Waverly’s bunting is Northface; Hat is from Old Navy (No longer available). Enjoy your weekend. We will be bracing for the craziness we are about to endure. I had TWO sinus infections while I was pregnant and they were the worst ones of my life since I couldn't take anything. Hang in there, momma! Hope you feel better soon! New follower! Just wanted to say hello! Love Waverly's name! Seriously…your world is about to be rocked! My little one is into everything now and I have to watch her every move 24/7! But it's so exciting to see how big they are and all the fun things they want to play with 🙂 Miss Waverly is just so stinking cute! My goodness that does sound like a tough week! Sleepless mommas= disaster. Once I was so exhausted I went grocery shopping, paid and then left all of my bags there. I didn't realize until I was already in my car, ahh! Haha – thanks Molly! Glad to hear that I am not the only one! And thank you! Hope you and little Beckett are good! 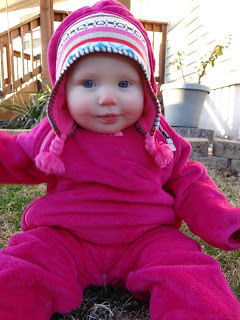 I love her snowsuit! It looks like the warmest thing ever! I wish it came in my size!! Haha – I know, me too! We do use it all of the time! 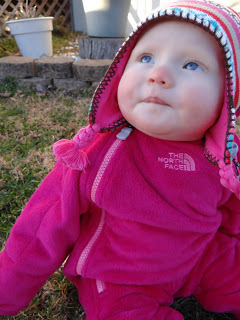 It is so nice to be able to take her on walks with it when it is cold out!